Late Shift by Edward Khoo has got all the right ingredients for the ten minute piece – nostalgic music, well-timed pacing of scenes, a good mix of characters and a male lead with an interesting face that seems to tell a story of its own without him saying a word. The Singapore American School alumni film-maker, eldest son of prominent director Eric Khoo, must have gotten the knack of making movies from his father, seeing that Late Shift, one of his first short films, gained a standing ovation at the Busan film awards, clear evidence of the film-maker’s ability to touch its audience. Starring David Chua as the male lead and local TV actress Ezanne Lee in a cameo role, there is no central plot in this piece; from the beginning whereby our male lead, a taxi-driver doing a late night shift picks up a tipsy customer who sings an out-of-tune Mandarin love song which is carried along the entire film, till its end where he reminisces about happier times with a lady, presumably his wife. Along the late shift, the taxi-driver has several customers; among them, a lovey-dovey young couple, an irritated national-service man on the phone, a Chinese lady who is distraught for an unknown reason, and a wailing Indian woman whose husband has just met with an accident. The passengers are from various backgrounds and they all experience very different moods within the cab, all of which is taken in by our silent male lead who doesn't seem to care at all; his seemingly mundane night-shift probably just a means to sustenance. 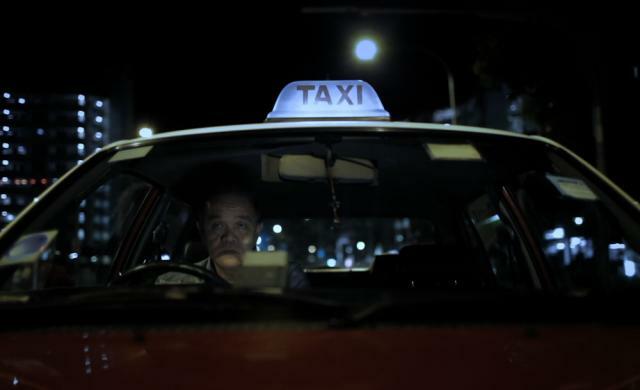 The short is held in place with impressive cinematography (seeing that most of it was shot in the night under artificial lighting) and it strikes a chord with any audience member who has taken a taxi in Singapore before, in which that one realizes that the driver ferrying you to your destination, could possibly be concurrently observing and passing his own judgement about you as the passenger throughout the journey. Slightly creepy in that sense, Late Shift is unpretentious and realistic in its portrayal of an elderly driver in his personal pains of aging without his partner, and the melancholic scene of him smoking stoically cannot help but tug on the audience’ heart strings, lingering on in one’s mind like the taste of stale tobacco as the old man drives on into the lonesome night.